This 52-week Diploma Program, offered online, provides public works professionals with the specialized knowledge to make tangible differences in their organizations and in the quality of life of their communities. This diploma program is conveniently delivered in an online format, meaning you can earn your diploma and complete all coursework from your own home with minimal disruption to your personal or professional life. Describe safety practices and procedures to protect self and others. Interpret blueprints, drawings and layouts using architectural and measurement conventions. Describe methods and procedures for the use of hand and power tools. Describe the methods and procedures required for the use of stationary equipment. Describe the methods and procedures required for rigging and hoisting operations. Describe methods and procedures required for formsetting. Describe the methods and procedures required for the placement of concrete. Describe earthwork, barrier and environmental control practices and procedures. Public Works Construction Technicians perform a variety of general labour duties, typically in a municipal, local government or First Nation setting. Therefore, it is important for workers to know the role and purpose of local government and relevant provincial, federal and First Nations regulations and legislation governing their work. Workers in this field are expected to work independently and as part of a team and communicate effectively with co-workers, supervisors and the general public. sewer and wastewater operations or fresh water distribution systems. Presents basic jobsite safety information to prepare workers for the construction environment. Describes the common causes of workplace incidents and accidents and how to avoid them. Introduces common PPE, including equipment required for work at height, and its proper use. Information related to safety in several specific environments, including welding areas and confined spaces, is also provided. Reviews basic math skills related to the construction trades and demonstrates how they apply to the trades. Covers multiple systems of measurement, decimals, fractions, and basic geometry. Introduces common hand tools used in a variety of construction crafts. Identifies tools and how to safely use them. Proper hand tool maintenance is also presented. Identifies and describes the operation of many power tools common in the construction environment. Provides instruction on proper use, as well as on safe-handling guidelines and basic maintenance. Introduces the basic elements of construction drawings. The common components of drawings are presented, as well as the most common drawing types. The use of drawing scales and how to measure drawings is also covered. Provides basic information related to rigging and rigging hardware, such as slings, rigging hitches, and hoists. Emphasizes safe working habits in the vicinity of rigging operations. Provides good techniques for effective communication on the job. Includes examples that emphasize the importance of both written and verbal communication skills. Describes the importance of reading skills in the construction industry and covers proper techniques to use in a variety of different written communication formats. Describes the opportunities offered by the construction trades. Discusses critical thinking and essential problem-solving skills for the construction industry. Also identifies and discusses positive social skills and their value in the workplace. Describes the hazards associated with handling materials and provides techniques to avoid both injury and property damage. Common material-handling equipment is also introduced. Describes the ingredients of concrete, discusses the various types of concrete, and describes how to mix concrete. The module also covers basic job-built footing, edge, and wall forms and form ties and describes the types and uses of concrete reinforcing materials. Covers tools, equipment, and procedures for handling, placing, and finishing concrete. Also covers joints made in concrete structures, the use of joint sealants, and form removal procedures. Emphasizes safety procedures for handling, placing, and finishing concrete. Covers the equipment, principles, and methods used to perform distance measurement and leveling. Also covers the layout responsibilities of surveyors, field engineers, and carpenters; interpretation and use of site/plot plan drawings; and methods used for on-site communication. Familiarizes trainees with basic blueprint terms, components, and symbols. Explains the different types of blueprint drawings (civil, architectural, structural, mechanical, plumbing/piping, and electrical) and instructs trainees on how to interpret and use drawing dimensions. Two oversized drawings are included. Covers the equipment and supplies required to perform structural work. Discusses bridge types and materials, bridge substructures, and bridge superstructures. Addresses structural concrete and structural steel. Explains how to perform hot mix asphalt paving and concrete paving. 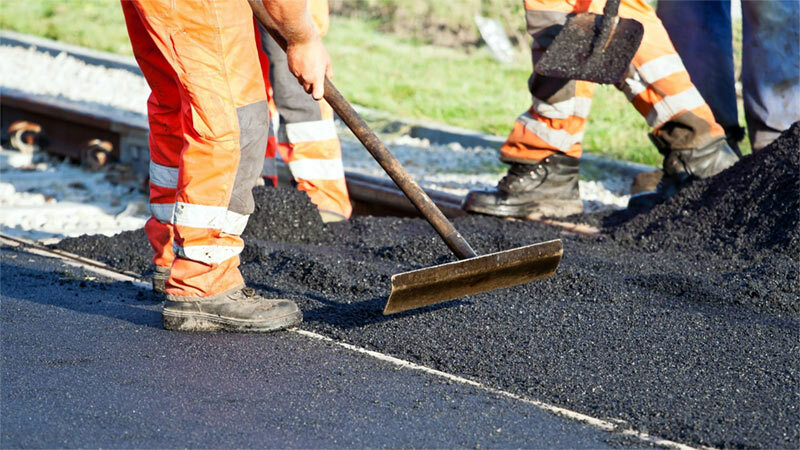 Provides descriptions for asphalt pavers and all equipment required to perform paving. Discusses concrete paving equipment such as concrete pavers, slip-form pavers, and texture/curing machines. Discusses the processing and preparation of asphalt and concrete, including quarrying, crushing, screening, and testing. Explains the operation of concrete plants, hot mix asphalt plants, and pug mills. Describes the necessary procedures for preparing ground for highway/heavy construction. Explains soil basics, including terminology, identification, and classification. Addresses earthmoving operations, such as laying out slopes and grades, site excavation, and hauling, along with methods of stabilizing soils. Discusses the below-grade construction processes that are necessary to perform highway/heavy construction. Covers excavation support systems, excavation safety, underground piping materials and fittings, joining methods for underground pipe, box culverts, and catch basins. Explains the types of cranes and forklifts used in highway/ heavy construction. Discusses crane terminology, safety, and operations. Covers crane handbooks and records. Addresses forklift assemblies, controls, safety, operations, and maintenance. Provides descriptions and operational procedures for many types of heavy equipment, including compaction equipment, loaders, backhoe loaders, scrapers, bulldozers, excavators, motor graders, and skid steer loaders. Covers safety rules and regulations for electricians. Teaches the necessary precautions to take for various electrical hazards found on the job. Also covers the OHSA-mandated lockout/tagout procedure. Explains how DWV systems remove waste safely and effectively. Discusses how system components, such as pipe, drains, traps, and vents, work. Reviews drain and vent sizing, grade, and waste treatment. Also discusses how building sewers and sewer drains connect the DWV system to the public sewer system. Describes the communication process between the rigger and the crane operator. Covers electronic communication as well as ASME hand signals for mobile, tower, and overhead cranes.